President Donald Trump apologized to incoming Supreme Court Justice Brett Kavanaugh Monday evening "for the terrible pain and suffering" that he and his family endured during his confirmation process, going so far as to claim that Kavanaugh was "proven innocent" of the sexual assault allegations made against him. Trump's comments, which he acknowledged as outside of the norm just prior to making them, came at a ceremonial swearing-in event for Kavanaugh in the East Room of the White House, two days after Kavanaugh was confirmed by the Senate and formally sworn-in as a member of the court by Chief Justice John Roberts. Trump addressed the controversy head-on characterizing the heated political debate over sexual assault allegations leveled against Kavanaugh by California professor Christine Blasey Ford and several other women as "violat[ing] every notion of fairness, decency and due process." "[In] our country, a man or a woman must always be presumed innocent unless and until proven guilty," the president continued. "And with that, I must state that you, sir, under historic scrutiny, were proven innocent." Though the FBI reopened its background investigation into Kavanaugh last week after Ford and Kavanaugh each testified about the alleged incident before the Senate Judiciary Committee no declaration of innocence was made, as Trump stated. At ceremonial swearing-in, Pres. Trump apologizes "on behalf of our nation” to Brett Kavanaugh and his family "for the terrible pain and suffering you have been forced to endure." As Kavanaugh spoke publicly for the first time since his combative and emotional testimony before the Senate Judiciary Committee last month, he praised the president who appointed him while seeking to repair his image as a non-political jurist. "The Senate confirmation process was contentious and emotional," he said, directly acknowledging the historically polarized fight over his nomination. "My focus now is to be the best justice I can be. I take this office with gratitude and no bitterness. On the Supreme Court I will seek to be a force for stability and unity. My goal is to be a great justice for all Americans and for all of America." Earlier in the day, Trump told a convention of police chiefs the controversy constituted a "disgraceful situation, brought about by people that are evil." "He's a great person and it was very, very unfair what happened to him," Trump said in Orlando Monday afternoon. "False charges. False accusations. Horrible statements that were totally untrue that he knew nothing about." "It was a disgraceful situation, brought about people that are evil," the president added, though it was unclear whether he was referring to Kavanaugh's accusers, Senate Democrats opposing his confirmation, or other unnamed individuals. 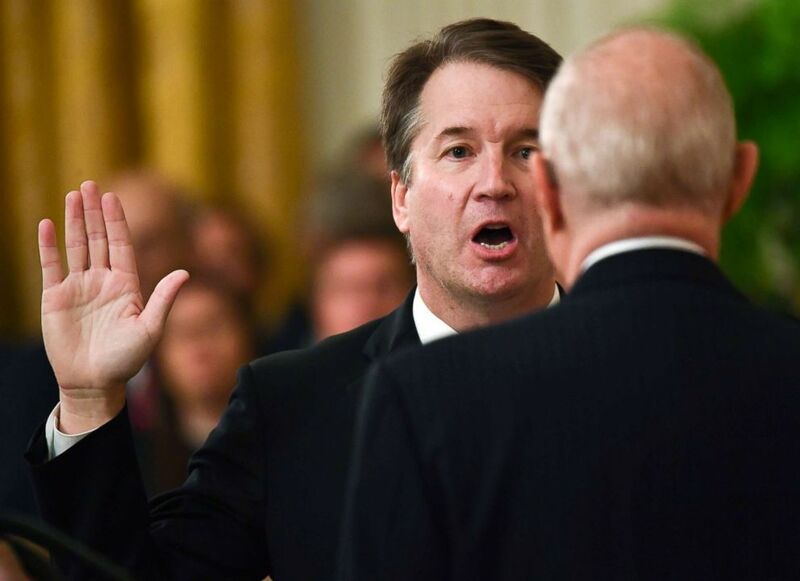 Brett Kavanaugh (L) is sworn-in as Associate Justice of the US Supreme Court by retired Associate Justice Anthony Kennedy at the White House, Oct. 8, 2018. The judge spent a portion of his remarks at the White House highlighting his work to "promote the advancement of women." "Women still face many barriers in the American workplace, and all of us have a responsibility to address that problem," Kavanaugh said, before noting that he had already hired four women to serve as his law clerks. He additionally appeared to push back on the insinuation that he would allow the confirmation process to color his jurisprudence following his heated testimony before the Judiciary Committee, during which he, at one point, referred to the actions of some on "the left." "The Supreme Court is an institution of law. It is not a partisan or political institution," Kavanaugh said. "The justices do not sit on opposite sides of an aisle. We do not caucus in separate rooms. The Supreme Court is a team of nine and I will always be a team player on the team of nine." At first, Kavanaugh seemed likely to march through the confirmation process with little controversy, but soon, allegations of sexual misconduct against Kavanaugh sparked one of the most contentious nomination processes in modern history. Ford accused Kavanaugh of sexual assault during a teenage party in the 1980s. Kavanaugh vehemently denied the accusation, but both he and Ford were called to testify about the alleged incident before the Senate Judiciary Committee. The next day, during a dramatic committee hearing, Sen. Jeff Flake, R-Arizona, said he would vote to move Kavanaugh’s confirmation to the floor on the condition that the FBI hold a formal investigation. One week later, after protests on Capitol Hill, a final, historically narrow vote was cast for Kavanaugh 50 to 48. 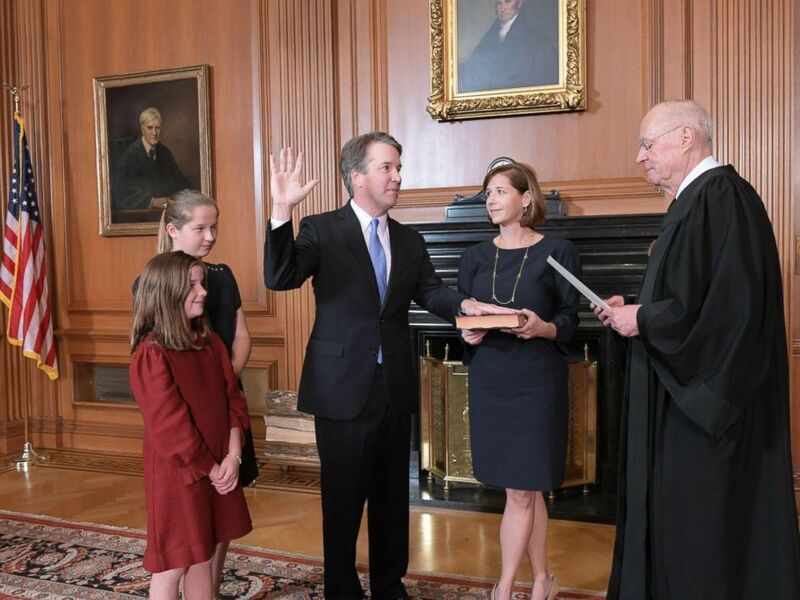 Kavanaugh’s wife Ashley held the Bible as he took the Constitutional Oath as his two daughters stood by his side. Justice Anthony Kennedy, whose place on the Supreme Court Kavanaugh is replacing, administered the Judicial Oath and the eight other current members of the Supreme Court observed from the front from the front row in the East Room. First Lady Melania Trump did not attend the event due to a previously scheduled event. On Tuesday, Kavanaugh will hear the first two cases of his tenure on the court, STOKELING V. UNITED STATES and UNITED STATES V. STITT, cases that deal with the nuances of robbery and burglary respectively. After weeks of controversy, the president on Monday lauded efforts by both Kavanaugh and Senate Republicans to keep working towards the confirmation process amid the controversy, claiming that "a lot of people would've said, 'let's give it up, let's go a different direction.'" "We all toughed it out together and I have to thank the Republican senators that fought so hard for this because it wasn't easy," Trump said. "And it was a great honor to be involved in the situation."